Unit 422 has it ALL, with not only Gulf and sandy white beach views but add in a calming lake, jetties, the East Pass boasting magnificent boat traffic, breathtaking sunsets and the perfect spot for watching fireworks. Spacious corner tiled unit with an office, 2 separate living/dining areas, 3 over sized bedrooms, 2 baths (one with double lavatory) and utility room. New dbl door refrigerator. NEW HURRICANE RATED DOORS AND WINDOWS. STORAGE GALORE. Kitchen has 48 drawers & cabinets, Carrara Marble bathroom countertops, 4 large closets for renters and a 6x18 storage both can be locked for absentee owners use. The 6x18 storage can be remodeled to make a 4th bedroom. There are 2 balconies measuring 12x9 and 28x9. Approx. 1812 sq. ft heated & cooled with 2304 sq ft under roof. You areonly steps away from the pool, hot tub, 3200 sq. 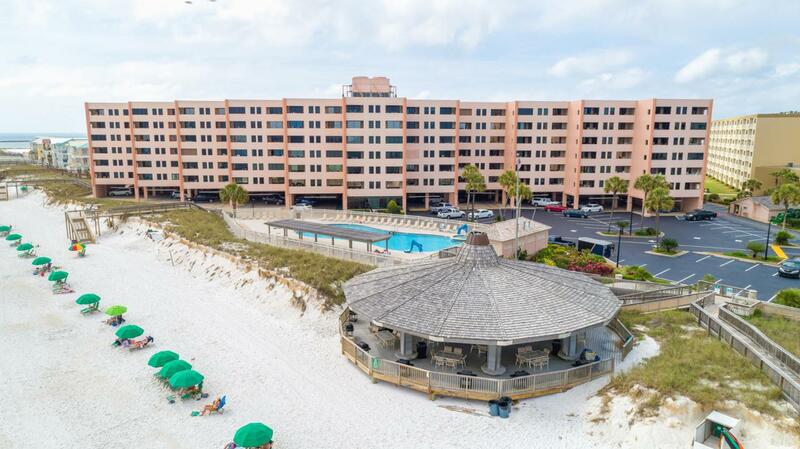 ft. pavilion w/BBQ grills, tennis courts, shuffle board & 800 feet of pristine white beach right on the Gulf of Mexico. Take a short walk to the jetties for fishing & a cove for snorkeling. Jetty East offers covered parking. The Owners room has recently been remodeled and can be rented for weddings, guest gatherings and owner functions. Gated community with 24/7 Security. Owners Pets are allowed. The additional income from the rental company and the owners room reservations help keep the Association dues low. Buyer to confirm any measurements/information they deem important.